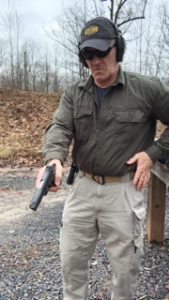 The tactical reload is important skill to master and is a relatively easy one to learn. This is one of the defensive handgun tactics you will learn at any defensive firearms training class. Administrative reload is simply loading or reloading the gun at the range during practice or at home before taking it with you for the day. Emergency reload is reloading the gun during a gunfight when the gun is empty. As the name implies, this is an Emergency and the skills to perform this reload are very important. 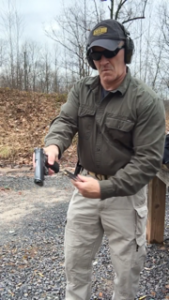 Tactical reload is simply replacing a spent or partially spent magazine with a full one. It is needed to reload the gun during a gunfight. It will typically be used after several rounds have been fired but the gun is not yet empty and more rounds are likely to be needed. We will be dealing with this reload in this article. Is the Tactical Reload Really Necessary? 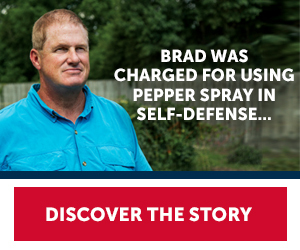 There is some controversy as to whether this is a necessary skill, especially for civilian CCW holders. The reason is that most actual gunfights are over in seconds, and fewer than 8 rounds are fired, usually only 2 or 3. It is also argued that there is rarely a “lull” in any gunfight when this reload can be implemented. also, the stress that will be experienced in a real gunfight is probably going to be so great that you will more than likely empty your gun before you even know it, and now you need to perform an “Emergency Reload”, not a tactical one. 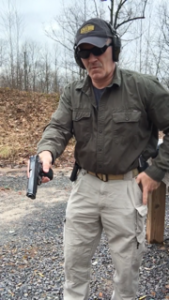 Regardless of differing opinions, I will show you how to perform the tactical reload and show you the drill to practice it. If nothing else, it will be heavily used at your next handgun training class as you will be constantly reloading your pistol on the range. This is especially true if you use a 1911 as I do! 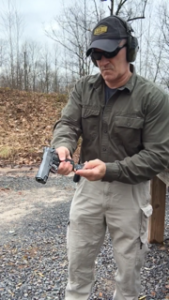 The purpose of this drill is so you can learn to reload your handgun quickly, easily, and really without even looking or thinking about it. The theory is if you are ever in a gun fight and you have to shoot a lot of rounds, at some point you are going to run out. Related Article: Why Use Snap Caps and Dummy Rounds? 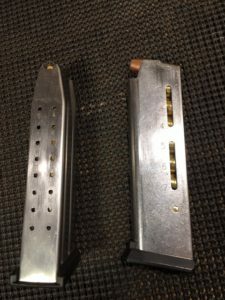 So, if you get a second or two in the middle of the gun fight where you are not actually shooting, or you are on the range between shooting drills and you know that your magazine is no longer full, you can use this technique to quickly remove the magazine from your gun and replace it with a full one. Of course this assumes that you are carrying a spare magazine to begin with! You arrive home to find your front door ajar and you can hear your kids screaming and crying inside, along with unfamiliar voices. You draw your sidearm and enter the house using the ”house clearing” methods you learned at Front Sight. As you go room to room, you see a bad guy pointing a gun at your spouse, so you take him out with 2 rounds to the thoracic cavity. You return to cover (more likely “concealment”) knowing now that there are an unknown number of additional threats elsewhere in the house. You do not know how many more rounds you will need and you are already down by two. This is a good time to perform a tactical reload with a fresh, full magazine!! Who carries a Spare Magazine? In reality, most concealed carriers aren’t going to be carrying a spare magazine. I recommend it, however I don’t believe it actually happens that often. Which brings us to another factor to consider, which is the type of gun you carry and how many rounds it can hold. For example, I own a Springfield XDm 9 mm that has a magazine capacity of 19 rounds, and with one round in the chamber, holds a total of 20 cartridges. Most Glock handguns can carry upwards of 15 rounds. However, I will admit that I love my 1911 and that is what I carry most often. Unfortunately, the 1911 magazines I use only have an eight round capacity. For this reason, I do tend to carry a spare magazine in one of my tactical pants pockets! My point is that if you are going to carry a spare magazine and practice the tactical (and emergency) reload until it is second nature, then it’s not a big deal what gun you carry. If you are not going to be carrying a spare magazine, I would highly recommend carrying a concealed weapon that holds 15 to 20 rounds. 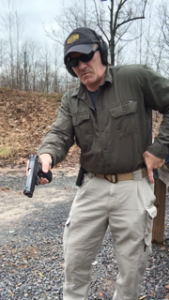 Here are the steps to perform a tactical reload. This drill is performed from the “ready”, which means the gun is at approximately a 45 degree angle towards the ground and grip is firm but somewhat relaxed. The entire sequence is performed with the gun in the “Ready” position. Important note: your trigger finger is outside the trigger guard when in the ready position, and at NO TIME during the reload does the finger go into the trigger guard. In other words, keep your booger hook off the bang switch! 1. Using the support side hand, check for a fresh magazine on your belt. 2. Assuming you have a fresh mag, press the magazine release button on the gun with the firing hand thumb, altering your grip slightly if it is necessary to reach the release. 3. Remove the depleted magazine with your support hand and place it in a pocket. Since it isn’t empty, you want to hold onto it in case you need more ammo later. 4. Using your support hand, grasp a fresh magazine from your belt holster. Use a proper “indexing” grip with you forefinger on the top round. this allows you to be sure the top round is firmly seated in the magazine, and allows you to easily guide the magazine into the magazine well of the gun. 5. Insert the magazine into the gun with one smooth, firm action. Your palm should be on the bottom of the mag, firmly locking it into position. 6. Place your support hand back on the grip, ready to raise the gun into firing position if necessary. That’s it. Now go and practice this drill. 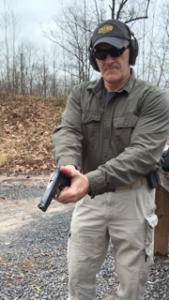 Also, read my articles on clearing Handgun Malfunctions. Learn to clear the Type 1 Malfunction, Type 2 Malfunction, and last but definitely not least, Type 3 Malfunction. Better yet, check out my review of Front Sight Firearms Training Institute and get yourself some professional training that is quite affordable. This is awesome stuff! My wife just got her first pistol (a little .38) for conceal carry. We live in a great area, but it is a vacation town and we get a lot of trouble makers from time to time. Home theft can be a problem, and my wife wanted to be prepared. We started looking online specifically for tactical training, how to clear a house, defensive positions, etc. So glad we found this site! We’ll be coming back from time to time to check out your new stuff! Anyway, what do you think? Would it be better to get my wife a Glock with a higher magazine capacity? Or have her stick with the .38 and practice the tactical reload (and of course carry that extra magazine). Kmv, thank you for reading and commenting on my tactical Reload article. When it comes down to the gun someone chooses to carry, the most important thing is that they are comfortable with it and know how to shoot it, load it and clear any malfunctions that may occur. 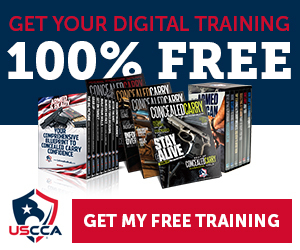 The more one trains with their carry gun, the more likely they will survive a deadly threat. Training is more important than the equipment, assuming the equipment is in good working order!